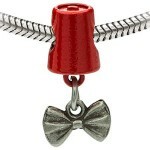 Are you looking for a fun Doctor Who bracelet? How about this charm bracelet that has a little Doctor Who logo on it and of course the Tardis. 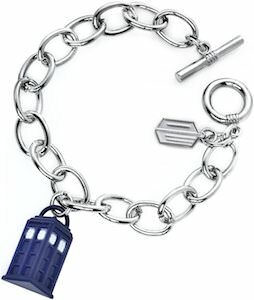 The bracelet is 7 1/2 inch long as has a silver finish except of course the Tardis that has a blue enamel finish. A fun piece of jewelry like this is just perfect for any day of the week. Work, school or at home the Tardis bracelet is just fun to wear. Now you can have a piece of the Doctor with you where ever you go. Doctor Who fans come take a closer look at this Doctor Who Logo And Tardis Charm Bracelet.